If you’re in San Francisco and get a craving for In-N-Out Burger, now you can order from the on demand In-N-Out delivery service app, burgerto.me. 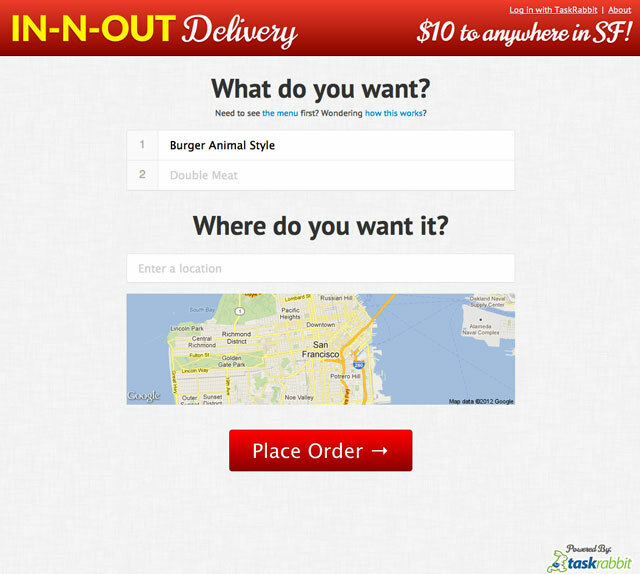 For a flat fee of $10 (plus the cost of the food), you can get items from the In-N-Out menu delivered to you. The app is powered by the TaskRabbit Deliver Now service and was created by Todd Eichel and Loren Cheung at a TaskRabbit Engineering Hack Day. Its source code is available on GitHub. The average In-N-Out delivery takes less than an hour. During peak lunchtime hours, deliveries may take longer.